Not long after we moved into our home, we planted some trees in the backyard. Many of them didn't make it that first year and had to be replaced, but the Maple we planted in the center of the backyard thrived. Today, I am impressed with how tall it's grown in just 6 or 7 years. Kevin is really starting to enjoy the Maple. Sometimes I'll look out into the backyard and panic because I can't see him. 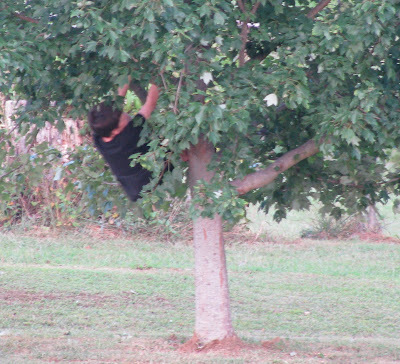 Then, he'll peek out from INSIDE the tree to let me know he's still there. 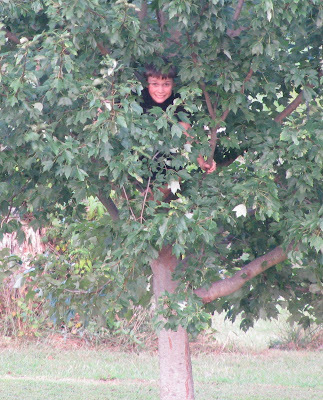 The photos of Kevin in the tree make me smile every time I see them. So, when I received them in my photo order, I couldn't wait to scrapbook them to document this memory. Now I have this memory documented for Kevin, too. 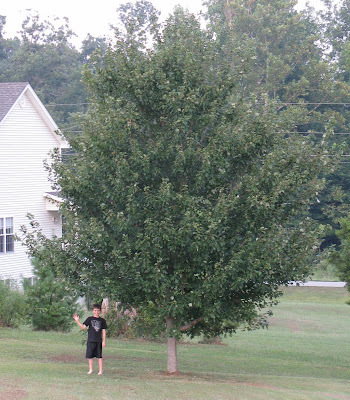 We planted a Silver Maple in our front yard & it grew like crazy. Within about 8 year we ended up having to cut it down because it got so big that part of it was growing on the side of the bank & leaning towards tehe house. I have not stopped by or been in touch with my bloggy friends for so long. It is so nice to see you and your family are doing well! I can't believe it has been a year since your surgery! WOW! You look great! The boys are so cute and are growing up so fast! 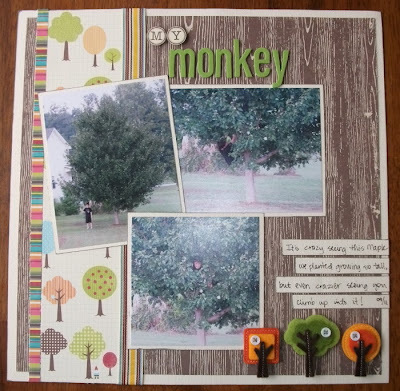 Your layout is beautiful as alway and I LOVE those trees! Many blessings Amy! Great seeing you! Awesome! I would love a climbing tree in our yard.